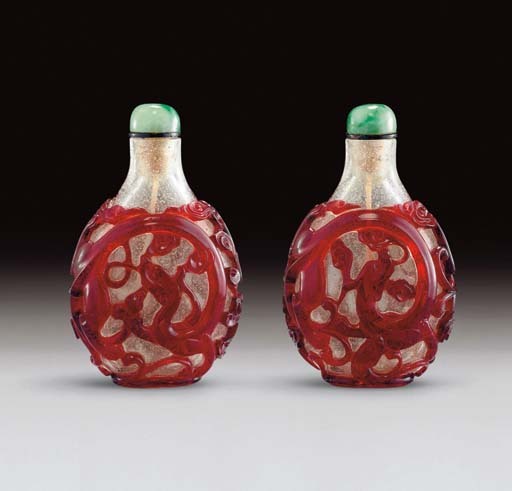 The Imperial attribution of this bottle is based on two main features - firstly, the use of ruby-red glass, which was probably an Imperial prerogative for the earlier part of the eighteenth century, but in any case was an Imperial staple, and secondly, the chi dragon design, which was a very popular motif used at court. This bottle is typical of Beijing output, and the beasts are extremely well composed and carved, with an exceptional quality of finish. An example with very similar carving of the amber-brown overlay on an amber glass ground, formerly from the J & J Collection and illustrated ibid., no. 369, was sold in these rooms, 30 March 2005, lot 48.